Tom has been building Condominiums and Single family homes throughout Massachusetts, New Hampshire and Maine for the past 15 years. A graduate of University of New Hampshire's Construction Management and Studio Art Programs, Tom relies on his extensive Building Science, Design, and Project Management skills to excel home building projects and bring high quality homes to new homeowners. 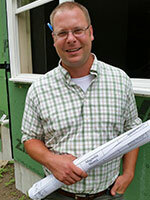 Tom also possesses a State of Massachusetts Unrestricted Licensed Construction Supervisor-2009. He resides in the Seacoast of New Hampshire with his wife and two daughters."